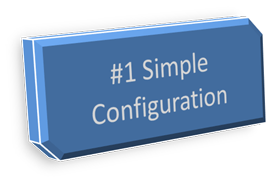 Welcome to part 1... today we're looking at supporting basic configuration in components without additional coding by using the windsor container. So - with the container we can provide configuration for a component which is loaded at runtime, so every time you start your app it will be read in - you can do this using the configuration support in .Net - but using castle makes support for this very code-light in comparison... let's take a look. By default the tax rate is 12.5% - but we can change the tax rate by setting the "Rate" property. The windsor container is constructed with an "XmlInterpreter" - this configuration will pull the setup for our container from a section in the App.config. Now, what about changing the tax rate in the configuration? And that's part 1 done - so now you can see how can we supply configuration parameters, and provide sensible defaults for them. Well it's over - and it's been great! First off Architecture Camp 2007 was a lot of fun to present at this weekend... the relaxed nature and opportunities for everyone to talk, rather than just listening, was great - a nice soft introduction to a newbie presenter such as myself! And a big hat-tip to all the guys who helped put this together, including Alex James, Kurt (where's your blog boy!) and Chris + all the other presenters. The thing I liked the most about this event was the number of people who brought their a-game... damn but there were some seriously experienced and intelligent guys in the audience, asking great questions - contrasted with the often pointless heckling and misguided questioning you can get at events like teched, this event was great ... if you couldn't make it, definitely try to get to the next architecture camp, and if you were a no-show ... shame on you! I'm still not 100% sure if my session got recorded or not, but if it did, I'll point you to it at some point... in the mean time - here's the presentation itself in both pdf and pptx (powerpoint 2007) formats. Case study for any large organizations considering deploying it across their organization. Provides a place Microsoft can. Host open-source projects for life. Control and support the environment. Keep a single message across their organization - we use TFS for source control from now on. It has a strong Microsoft / .Net focus. You can play with TFS. The beta command line client is a good thing, but to counter that "6 months wasted effort" with a call to replace TFS with subversion in Codeplex ... that just seems counter-intuitive to me... suddenly you have a roll-on effect of zero integration between source control and the in-built issue tracking mechanisms... so what, lets replace that with Trac??... and now that comes with it's own wiki... so ditch the existing one... and suddenly Codeplex is nothing more then a shell for managing file releases with some forums. What kind of message would it send to microsoft customers who have invested time and effort into team system... let's be reasonable, it's just not going to happen, so whats the next logical step... improve the tooling to work with the existing source control solution... first step to achieving that... build a decent command line client! So... if you are looking for subversion based hosting why not use well established players who have been supporting open source from the beginning like SourceForge or tigris... don't they still deserve your love now more then ever since Codeplex is on the scene... what better way to vote than with your choice of OSS project hosting? Jonathan Wanagel, who I commend for being vocal about what's going on at codeplex... he seems to pop up on a lot of blogs I read) ... they certainly do seem a little damned if you, damned if you don't at the moment - especially when progress is slowly being made and demonstrated. If you have to make your own license keys i.e. Here's some thoughts/ideas for things you can do to break up the key space a little so people can not easily brute-force your keys by fiddliing just a couple of numbers. Select a range of numbers and letters that can be directly mapped to 32 values (10 digits and 22 alpha maybe?). Know your maths.. creating helper classes for unpacking and packing bytes will help. In this example you could carry 125bits (15 bytes and just over a nibble ;o) ... or 13 bytes + CRC16 (or Maybe an Adler16). Use lookup tables to translate sequential values into pseudo-random values. Break any multi-byte values up into individual bytes, stuff em around your payload of bytes in non-sequential offsets. Calculate the CRC for your payload and include it as part of the key's data, verify it when you're decoding. Use Marshal.Copy etc. methods to copy between the struct and a byte array. Remap individual bits in the overall payload. you end up with very unique looking keys that have no sequential behaviour to them (especially if you redistribute the bits of the CRC into all the bytes of the key, which in turn are repacked into 5 bit letters). No easy way to diff/merge between your version and the latest version on source control (because you could only get the source as a tarball). Team Foundation Scalability ??? And why CodePlex exists?
. ---> Attempted to perform an unauthorized operation. Still, not to get too disheartended I decided to try it on a project I coordinate for (ye olde Splicer...) and I can certainly confirm it works... considering that the command line tools are less than 200K, this is already a great improvement over the current situtation... (about 250mb to download Team Explorer's iso). So as you can see ... it does work... but I have to say it's pretty damn slow (could just be because I'm in New Zealand of course). ... and on one last note... the gui check-in looks a little like TortoiseSVN don't you think... hopefully the work towards some feature parity there.